Detoxify and nourish with this one-of-a-kind aromatic facial that authentically renders fine ancient Ayurvedic beauty techniques. Not only will you receive a facial and stone massage, you’ll also have a choice between a hand, scalp or shoulder massage. You will also receive an Ayurvedic herbal application for shining, radiant skin. You will leave the spa refreshed and emotionally balanced. The Benefits of Aromatherapy It’s an alternative medicine treatment that uses fragrant essential oils to please and soothe the senses. It is believed that inhaling essential oils used in aromatherapy stimulates a specific part of the brain. The various fragrances cause our brain to send signals to our body, releasing chemicals that make us feel relaxed, calm and refreshed in the process. 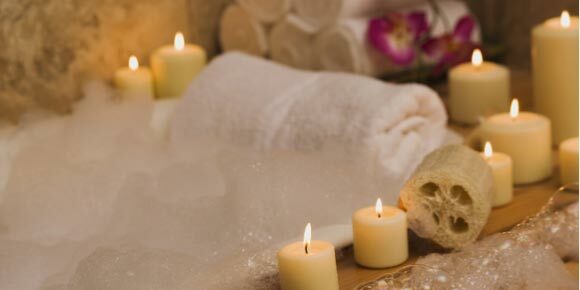 Massages or baths complement the effects of the oils.